As the bride, you know all about gifts. After all, you’ve probably registered at a few different places (at least!) to coordinate all the new gifts you’ll be receiving with your new home. And even though you’ll generally be on the receiving end, there are a few gifts you get to give as well. Bridesmaid gifts are a personal thing, to say the least. Unless you have extenuating circumstances, your bridesmaids are probably pretty close friends, and you’ll want to do something special for each of them. But what exactly should you do? Try to spend the same amount on each gift. This doesn’t mean you need to get each bridesmaid the same thing, but it’s a good idea to not let anyone feel left out or shafted. Think about getting your Maid of Honor something extra special. She’s got a different title, hasn’t she? Well, there’s a reason for that, and her significance in your wedding (and in your life) probably warrants something a little extra special. 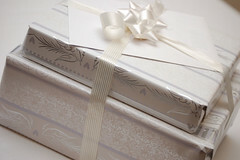 Enclose a personal note with each gift. This way, even though your gifts might or might not match, each of your bridesmaids will know how important they are to you. Just remember that when it comes to getting bridesmaids gifts, there is no right or wrong answer. Just make sure it feels right to you, and they’ll love whatever gift you choose to give! You’ve dreamed about your pale confection since your favorite Barbie doll zoomed through the kitchen in her pink Malibu convertible. You chose the sleeves by third grade, the train length by fifth, and the groom by sixth (that one didn’t work out). But have you ever parsed out why you want a white wedding dress with seventeen layers? It’s because of Queen Victoria. Yes, she who reigned during one of the most prudish eras in history. She who allegedly proclaimed “Lie back and think of England” during the marital duty. This might lead you to the natural conclusion that Queen Victoria wore white to her wedding in 1840 to demonstrate her purity and blushing innocence. Actually, she wore white to show that she was really, really rich. White was highly impractical in the 19th century. Few women could afford a dress they would wear only once, and the likelihood of dripping wedding supper roast fowl on a white bodice was high. Cementing the trend was Coco Chanel who created the first short wedding dress in the 1920s. In white. Thanks to the vagaries of history and economics, you no longer need to be royalty to afford a white wedding dress. Just have a sturdy Visa card. Opening your wedding gifts kind of feels like Christmas, except that it’s all about you and your new spouse! The only difference is that none of your new gifts came from Santa, and you’ll definitely need to thank each and every one of your guests who gave gifts. It may seem like a daunting task, especially if you leave it all till the end (like I did), but if you consider the following 10 tips for writing thank you notes ahead of time, getting all your cards out to your guests is sure to be a breeze! 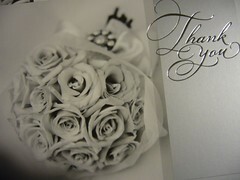 Have your fiancé, or husband as the case may be, help you write and send out thank you notes. Maybe he would feel more comfortable writing thank you messages to his friends and family. Write down what you received and from who immediately after you open a gift. If you open a lot of your gifts at once, like after the reception, that makes keeping everything together a little bit easier. General etiquette advises that you have all of your thank-you notes sent out no later than 3 months after the wedding has taken place. Many couples send out thank you notes that match with their wedding invitations, but you can easily choose to go a completely different direction with your thank you notes. Don’t try to write all of your thank you messages in one sitting; if you do, your notes will all start to sound the same, and they’ll start to sound trite. Instead, try writing only four or five in a sitting so you don’t burn out. For monetary gifts, you don’t need to mention the amount you were given, but you could easily mention how you intend to use the money. This extra effort actually makes thank you notes for cash gifts easier to write! If the giver of a gift traveled a long way to attend your wedding, it is appropriate to include a sentence thanking them for the trip. If the giver could not come, you could mention that they were missed. You can sign your thank you card in a few different ways. “Love” is probably appropriate for your close family and friends. A less familiar option for others is “With Affection.” Finally, for gift givers who are more acquaintances than friends, a simple “Sincerely” is probably your best bet. Etiquette doesn’t specify whether you should sign with your surname or not, so you’ll need to go with your instinct. If it feels to proper to add it, go without. Step One: Flattery will get you everywhere. Practice exclaiming, “You look beautiful!” in your bathroom mirror. Check your smile. Is it sincere and gracious? Good. Now, make sure the inflection of your voice conveys the proper punctuation. Too much exclamation point and you risk being thought obnoxious (or drunk), too little and you might sound patronizing. Don’t try to fake the sincerity (it’s difficult, not to mention shaky moral ground), just practice selective vision. Even if she has a large mole growing on the side of her face, one that provides a base camp for several luxurious hairs, she can still look nice in a pantsuit. Or macramé vest. Step Two: Ask questions. People like talking about themselves even more than they like the proverbial smoke up the rear. If you’re subjected to a forty-minute treatise on the state of her bunions, complete with pie chart, so be it. If it’s a dissertation on her many accomplishments as the first female heart surgeon in Michigan – while you’re still working at a bookstore (and not even the good one with the cappuccinos) – accept your lot. Smile, nod, and listen, even if you’re dying a bit inside. There is always some common ground. Somewhere. Find it and cling. And if you happen to love your mother-in-law, revel in it – especially if you don’t have to ponder the gentle waving of her chin hair. So maybe you’re all about the contemporary wedding: you’re going green, you’re adding a dash of color to that gown of yours, and you’re even getting married far, far away on a beautiful tropical island. But even if you are a completely modern bride, there’s one tradition I bet you’ll keep: something old, something new, something borrowed, and something blue. Sound familiar? It’s a cute little rhyme that you’ve probably had memorized since you were a little girl, right? But do you have any idea where it comes from? Most brides don’t, they just know it’s supposed to bring good luck. Well, it’s time for a little history lesson ladies! Something old symbolizes continuity with the bride’s family and the past. Something new means optimism and hope for the bride’s new life ahead. Something borrowed is actually supposed to be loaned from a happily married friend or family member, whose good fortune in marriage is supposed to carry over to the new bride. Something blue goes back as far as ancient Rome, when brides wore blue to symbolize love, modesty, and fidelity. The silver sixpence of course represents a wish for wealth and good fortune. Really, where would you put it other than your shoe? So now that there’s actually some meaning behind each of these items, be sure to incorporate them into your big day! You certainly don’t want to turn your back on an age old tradition. Besides, there’s so many fun ways to incorporate old, new, borrowed, and blue items, that the good luck might just be an added perk!